NOTE from CSI: The original edited and translated version of Carl von Clausewitz: Two Letters on Strategy was published earlier by the U.S. Army War College Art of War Colloquium in November 1984. This edition has retained the editing style of the original. The present text, however, rejoins the original letters into whole documents, contradicting what the translators indicate as their intentions in paragraph 3, "A Note on the Text," page 7. Professor Paret has granted his kind permission to allow us to revise the first pages of Clausewitz's text in accordance with the translation found in Peter Paret, Understanding War: Essays on Clausewitz and the History of Military Power (Princeton, 1992). 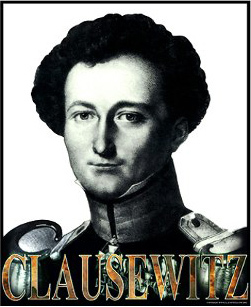 The portrait of Clausewitz [in the CS PDF] is taken from a lithograph in the possession of Peter Paret. [The version of the portrait above is of a poster designed by Clausewitz.com and available from Cafe Press.] The portrait of Roeder was originally published in the fifth volume of Kurt von Priesdorff, Soldatisches Führerrum, [1938?]. The page of Clausewitz's letter of 22 December 1827 was first published as an example of Clausewitz's handwriting in Rudolf von Caemmerer, Clausewitz, Berlin, 1905.